This park is nice off-leash dog park very close to the heart of the city. It sits in Yaletown under the Cambie bridge with views of False Creek. You'll see lots of other dogs here and kids playing on the nearby playground. Expect interaction between the two parties as well as the occasional rollerblader whizzing by on the mult-use path. We love Vancouver because it allows furry friend's a chance to get off the leash and socialize with other furry friends. There are quite a few Vancouver downtown condo owners with large and small dogs and you'll probably get to know them after a few visits to Cooper's park. For directions and more information on Cooper's check out the Park Board's website. Located between Stanley Park and Coal Harbour is a 4.42 hectare park with a dedicated off-leash area for dogs. 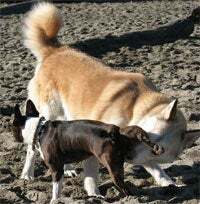 What's been called an elegant park is close to the downtown core and offers Vancouver downtown condo owners a great space to exercise their dogs. You'll see other dogs, bikers, and walkers. Find out more here. For those of us with children living in Vancouver downtown condos you'll have lots of options to stroll your young child around the city and visit parks with other parents. Be sure to stop into the Roundhouse in Yaletown where you'll find lots of sports, activities, classes and programs for kids and adults.